This has been the most crazy college football season… and one of the best I’ve ever witnessed. I attended almost all the home games at Amon Carter and even flew to San Diego to watch my Frogs pound on the Aztecs (yes, I had another priority in ‘America’s Finest City’, but my Frogs were pretty close to the top). I’ve never made a blondie before (forgive me), but I was really impressed with these. I’m even thinking that subbing cocoa powder next time would make the perfect brownie! 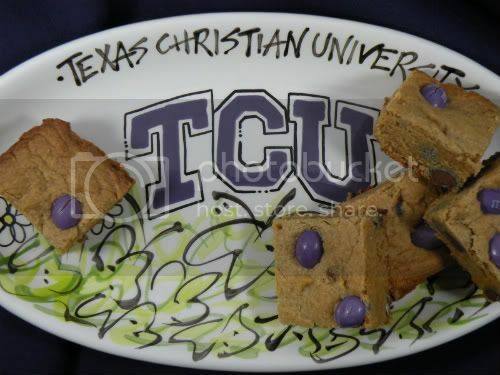 So, in honor of TCU’s 12-0 season and #4 position in the BCS rankings (so far! 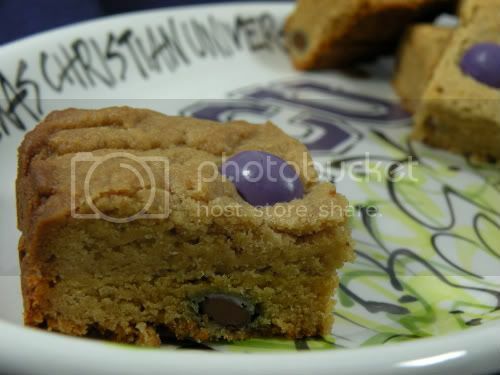 ), I made these Peanut Butter Blondies (with purple M&Ms!) to enjoy during the selection show. I’ll be watching with crossed fingers and toes and hoping that the BCS selection committee will extend a nice little bid to the Horned Frogs this evening. Thank you to Gary Patterson and the Frogs for such an amazing and exciting season! Preheat oven to 350 degrees F. Lightly butter and flour an 8X8 pan. In a medium microwave-safe mixing bowl melt the butter for 20-30 seconds until almost all of it is melted. Allow to cool for 5 minutes. Stir the peanut butter into the butter until creamy and smooth. Add the brown sugar to the butter/peanut butter and stir until smooth. Add the egg and vanilla and stir to combine. Add the flour, baking powder and salt to the peanut butter mixture and stir until the flour is almost completely incorporated. Gently fold in the plain M&Ms and 1/4 cup of the peanut M&Ms. Pour into the pan and spread evenly. Distribute the remaining 1/4 cup of peanut M&Ms on top and gently press them into the mixture. Bake for 20-30 minutes or until a toothpick comes out clean. Allow to cool completely on a wire rack. Cut into squares and serve. That is the recipe I made for PB blondies! They are awesome and a true fave around here! Love the colored M&Ms. 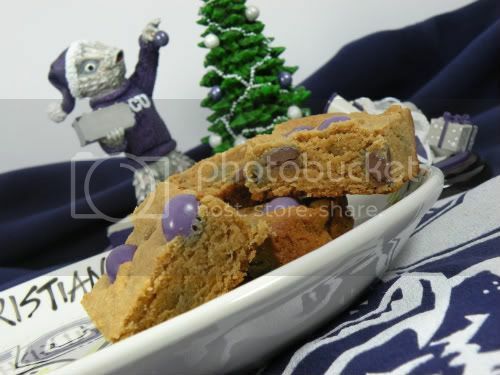 Yeah for football and PB blondies!! I’ve made these twice and each time the batter is of a “thick frosting” consistency. Definitely not something that can be “poured” into a pan. Am I doing something wrong? They taste fine though. Nope, nothing wrong on your part. I guess the better word would be “dump”, but that sounds so bad! 🙂 Once the batter is in the pan, use a spatula to flatten/spread it out and it’ll be fine!